Remove rind from ham and score the fat with a sharp kife, creating diamond shapes all over the surface. 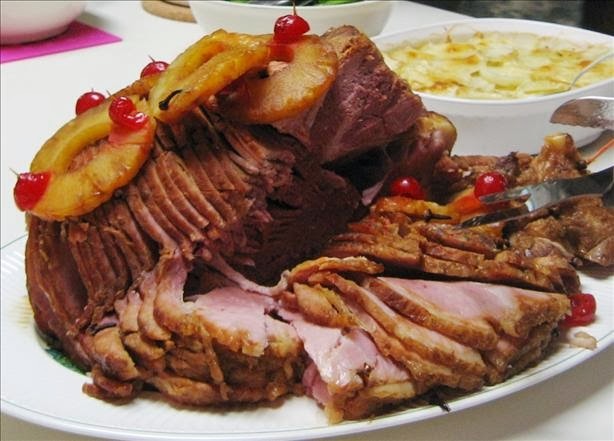 Stud ham with cloves (and pineapple & cherries, if desired- attach with either toothpicks or cloves). Place ham in roasting pan so that the wide flat cut side is down. Bake 2 1/2-3 hours for a whole ham, 1 3/4-2 hours for a half ham (or use the heating instructions provided on your ham wrapper, changing the cook temp if necessary as well). Mix dry mustard powder with the molasses and brush all over ham 30 minutes before the ham is done, returning ham to oven to contiune cooking at 325°F. TIP: Do not baste ham with pan drippings as this will make the glaze look dull. Once ham is cooked, let rest 10 minutes before carving. Do not eat the cloves- they provide flavoring as they bake, but should be discarded after cooking.